Police say a teen was hospitalized with serious injuries after he was ejected from a snowmobile and trapped under the wheels of a logging truck in Littleton, Maine. WCSH-TV reports the crash happened Sunday on Gentle Road near its intersection with U.S. Route 1. Police say the 15-year-old victim was driving the vehicle when he ran a stop sign and attempted to turn left to avoid colliding with the truck driven by Lawrence Schools. 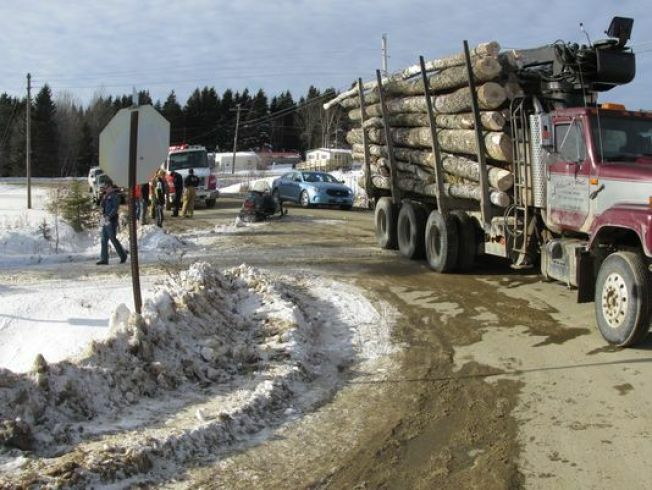 The teen swerved and struck a snowbank, tossing him into the wheels of the log truck. His arm was trapped underneath a wheel. Police say the boy was taken to Houlton Regional Hospital in serious condition.